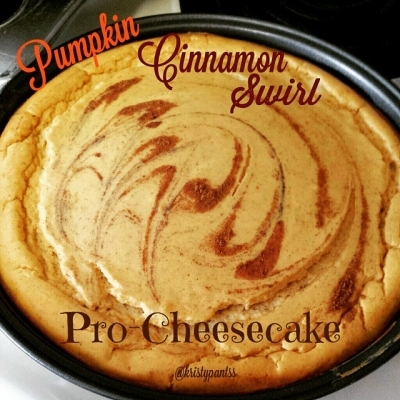 Delicious and creamy, guilt free CHEESCAKE! What more is there to say? For the cheesecake; two 8oz containers of fat free cream cheese (room temp, 1.5 cups nonfat greek yogurt, 3scoops vanilla whey protein, 1.5 cups baking stevia (measures like sugar! Check iherb.com code SIS866 saves you $10! ), 2 whole eggs, 2 egg whites, 2tsp vanilla, 1/3 cup pumpkin puree (NOT pumpkin pie filling. Only ingredient should be pumpkin), copious amounts of cinnamon and/or pumpkin pie spice (I always dump a ton in..so just do 1teaspoon or less if you're concerned). Bake for 60 mins at 300F. Let completely cool before slicing and then refrigerate. Makes 8 servings. It couldn't be any easier! I just used a regular baking dish lightly greased with coconut oil. I don't see the need for a special springform pan for this.